It's to the point where the Superboy title has been in sharp decline for so long that canceling it is probably a blessing; the cloned Superman character is probably better off in limbo or appearing just in the Teen Titans or another team title for a while to build anticipation for a new series sometime in the future. But though Superboy Vol. 5: Paradox starts out very roughly, there's a moment halfway through when it gets markedly better, and I want to recognize at the outset this volume of Superboy's MVP, Action Comics artist and fill-in Superboy writer Aaron Kuder (with artist Jorge Jimenez). Paradox starts out borderline disastrous, and though Kuder and Jimenez's efforts clearly aren't enough to right this ship completely, they do at least save this book and send the Superboy series out on a higher note. If you tilt your head and squint a little, there's tiny glimmers of comics legend Marv Wolfman doing what he does best in the first couple issues of this book. Namely, to start, he gets a chance to write the New 52 iteration of the Raven character he created, here given over more to the side of demons, and I sense some glee on Wolfman's part in getting to write "bad Raven." Second, Wolfman introduces the telepathic alien Schiz, buffeted by the emotions around her in a way entirely similar to Wolfman's Raven (with intentional similarities to the Legion of Super-Heroes's Saturn Girl), and this kind of emotionally-tormented character is right in Wolfman's wheelhouse. But by no means would someone call these issues "good." What gains Wolfman makes in name-checking the Legion of Super-Heroes and establishing an "evil Legion" behind the new "evil Superboy" Jon Lane Kent are entirely lost in a story that borders at times on the nonsensical. The situation Wolfman puts Kent in only barely seem to coincide with the future landscape that Scott Lobdell sets up in Teen Titans Vol. 5, and the confusion of circumstances isn't helped by Wolfman telling Kent and Schiz's story out of order. 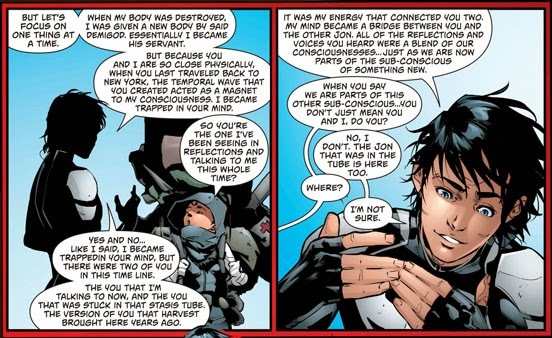 Admittedly Lobdell did not explain the motivations of this new Superboy very well earlier in the series and in Titans, but neither does Wolfman seem to have a clear vision of who Kent is or what he's trying to accomplish. Combine plot and dialogue difficulties with mostly standard art by Andres Guinaldo, and Paradox appears to be in a clear downward spiral. Wolfman's issues end with Kent venturing from the future to the present, and like Dorothy Gale arriving in Oz, all of a sudden the skies clear and everything looks a little brighter. Jorges Jimenez has a rounded, animated style not far off from where R. B. Silva started this series (Karl Kerschl, on covers as of Wolfman's last issue, also helps set the tone). The modern setting makes a difference, as Kuder is able to largely separate Kent from the future drama (Superboy's "evil Legion" is never seen or heard from again) and tell his own story under mostly-stable circumstances. That Kuder immediately sticks Kent in a Cadmus-type lab gives these final Superboy issues a nostalgic feel, but the teen scientists Kuder introduces are all trope derivatives of one form or another, and their hackneyed "dude" dialogue is more how an adult writer might believe teenagers talk, not how teenagers actually speak themselves. I give Kuder points for trying to write an ambitious story, and it does reach "epic" standards about the time the newly-teamed Superboy Kon-El and Jon Lane Kent have to fight their myriad time-lost duplicates alongside a new Green Lantern and others. At the same time, Kuder's time-twisted story gets so complicated that at one point it requires Jimenez to draw a full-on cartoon in the "Comics Everybody" style to explain it. Kuder's story is also one of the most dialogue-heavy in recent memory; I neither dislike complicated nor wordy comics, but at some point if a comic needs to be this wordy, perhaps it's complicated to the extreme. And that's just two panels! The end result of Kuder's story, however, is exactly what one might want from the end of the Superboy series: the "original" Superboy Kon-El, returned whole and hearty to the DC Universe, basically the same as he was a couple volumes ago, and ready for new adventures. I can't think of a better conclusion. The book actually finishes with the Futures End tie-in issue, which like the Harley Quinn issue, really doesn't tie in at all. 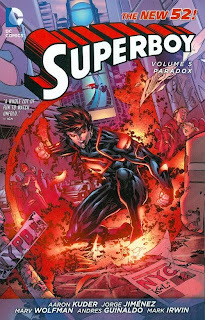 Written by Frank Barbiere with art by Ben Caldwell, the story is not especially compelling; it's tangentially related to what's been going on in the Superboy title in that Superboy fights some alternate clone versions of himself, though past and future don't entirely line up, making the end of this book as confusing as the beginning. I did take note of Superboy dating a girl named Roxy, thinking this was some reference to Roxy Leech from the Karl Kesel Superboy series; I realized later that Roxy, aka Freefall, is a Gen13 character. This perhaps suggests where Superboy will end up post-Convergence, but the Futures End issue still didn't feel wholly necessary. Whether another writer picks up on the threads from Superboy Vol. 5: Paradox will ultimately determine whether the book is really important or simply the vehicle for DC Comics to bring Superboy to a close. Either way, the real headline coming out of this one is that aside from making an artistic splash on Action Comics, Aaron Kuder shows good promise as a writer, too; I'd be happy to see Kuder and Jorges Jiminez follow Superboy wherever he shows up next. It's almost funny how they gave up on the new direction with evil Jon Lane Kent as the protagonist after just four terrible issues. For an unexperienced writer, Kuder did a pretty good job cleaning up that mess and restoring Kon-El back to his rightful place. What intrigues me is that the Futures End issue and the epilogue from Supergirl #33, both by Frank Barbiere and Ben Caldwell, seem to indicate that at some point DC intended to launch a new Gen13 series with Superboy as the team's leader. However, judging by the fact that Caldwell is working on the new Prez series and that Superboy seems to be headed back to the Teen Titans, those plans must have fallen through. And I'm no Gen13 expert; is Freefall really that well-known? Her inclusion went right over my head first time around. And given that Fairchild appeared in this Superboy title (also Grunge), I wonder if including the (better-known?) Fairchild would've raised more eyebrows. In the '90s, I'd say Freefall was as well-known and popular as the other Gen13 kids. She even had a major role in the straight-to-video animated movie, unlike Burnout and Rainmaker who were turned into glorified extras. Nowadays, however, Fairchild and Rainmaker are probably better-known than she is because of their many appearances in New 52 series like Superboy, Ravagers and The Movement. Free fall? I only know, from the 90's, Fairchild, Grunge, and Rainmaker. And I guess that 3rd girl who dated Grunge, but I don't know her name or power set. 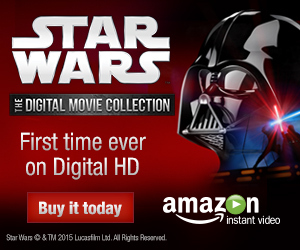 Do you buy every graphic novel you review? Ninety-nine percent of them. I'm fortunate on occasion to receive review copies and also libraries are a wonderful resource. It seems the New 52 titles have been more miss than hit, so maybe the post-Convergence status quo will help even the odds a bit. What are your top three (or more, if you prefer) favorite New 52 series? Not an easy question! And some series that might have started as my favorites or seemed most promising -- Superboy being a case in point -- didn't necessarily end up as such in the end. When the New 52 gets more done-er trade-wise, I'll have a post that considers the question you're asking. It's a shame what DC did with Superboy. Halfway through this volume, I simply stopped caring. Although I'm in no way a DC insider, it appears the book suffered from too much editorial interference...and The Culling debacle. The Superboy saga really didn't have the opportunity to organically evolve or blossom. Different writers came on and couldn't generate any momentum. Again, a shame. I don't really understand all the criticism Scott Lobdell receives. I believe he's a pretty solid writer. If DC had just allowed Lobdell some freedom to continue on the title, Superboy would've been a stronger book. Considering how well Supergirl fared (relatively speaking...she never put up Batman-like sales), I think the Superman family of books could have been more enticing.